My Japanese Maple warms my days!! Yumm!! It's definitely Fall here at Chez Ernst! One of my Very Favorite times of year....mostly because of the color scheme that Mother Earth provides! 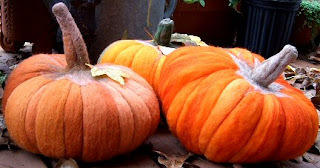 These felted pumpkins are from Decadent Fibers. These terrific women were next to us at Stitches East. Their products, both kits and finished pieces are just wonderful! Not to mention how lovely they both are! The harvest of the Summer's plantings....canning and hunkering down for the Winter ahead! It has been causing me to reflect on the past 10 months and all the good that has come my way! I would like to say thank you to all those that have been with me...both in Physical Presence and in Spirit! It's been an Awesome year! !....gotta go put a trinket on now!! Enjoy your Fall!! 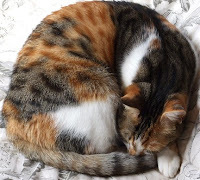 YOU are a 'trinket' that warms my heart! It was more than wonderful to have you in my neck of the woods and you're forever close in spirit! what great photos. you are definitely more than a trinket in my book! Beautiful, beautiful photos! Thank you, Sheila! And I got a trinket just yesterday in the mail, from a Navajo cooperative in New Mexico: a dreamcatcher necklace. A small sterling wire lace doily, in effect, with a small stone and silver feather, hung on a chain. It's perfect to represent the year I've had.